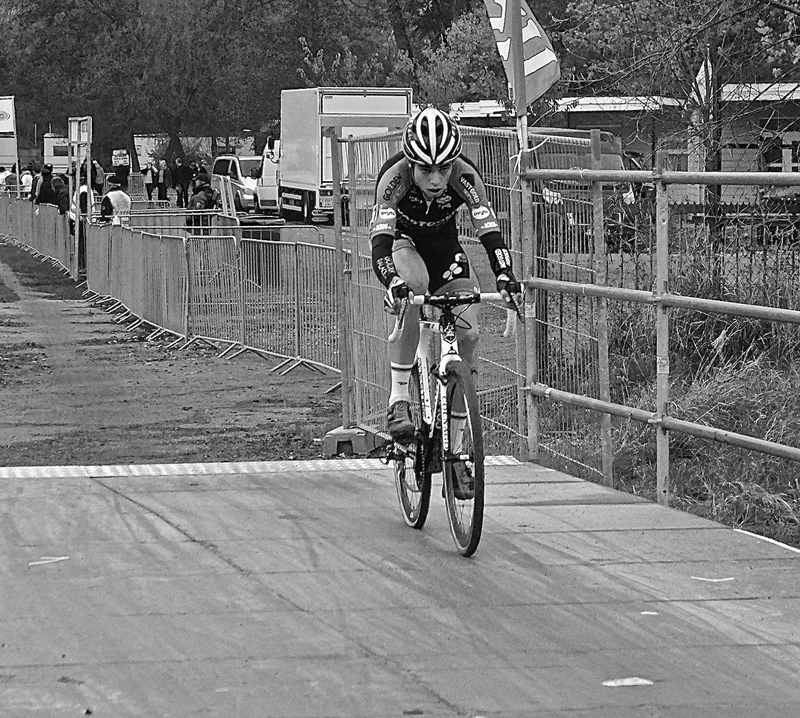 After last years inaugural outing to Koksijde taking in a round of the UCI CycloCross World Cup organised by East London Velo CC, Caelan put our names down yet again for more of the same. 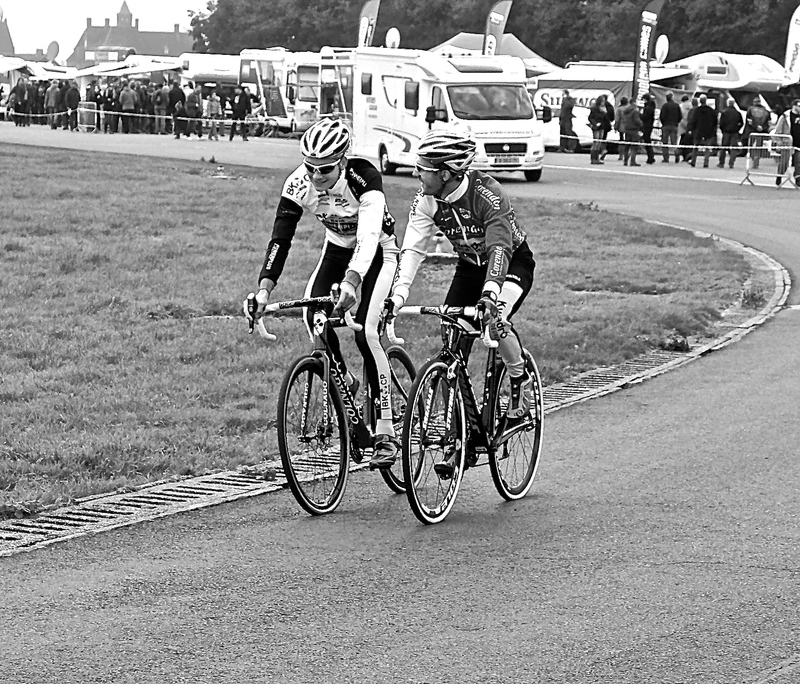 Now as he has become more obsessed with Cross as against road racing over the Winter season, he was excited to see the best in action and especially the Young Guns taking on the older Regulators. We arrived a little late only being able to catch the last few laps of the Elite Women’s race and it was a tough three way battle between Sanne Cant, Sabrina Stultiens and Sophie de Boer. Cant though on the final lap attacked before the last sand dune section and made a sizeable gap that the others could not bridge taking the flag comfortably and with it her first World Cup win. Now with 45 minutes before the Elite Men would take centre stage CJ was on a mission to find Wout Van Aert the 20 year old current under 23’s world champion as well as Mathieu van der Poel. These boys are the future and CJ has been watching with interest this season as they turn a wheel against the established old guard, but the absence of the youngster Lars van der Haar the first round winner forced out being unwell was a major disappointment to him. 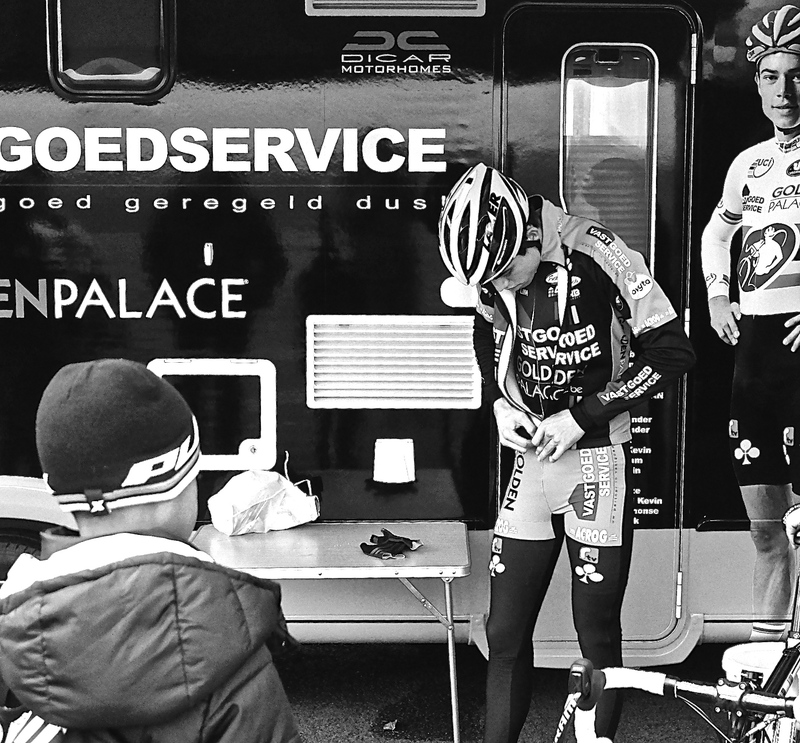 Approaching the pit area we spotted van der Poel warming up and it was obvious that any chance of a picture or autograph was not on the cards as he now looked for Van Aerts motorhome. Eventually the full length photo on the outside revealed his target though CJ wondered if he had already left for the start line until the door swung open and the man-child himself stepped out. 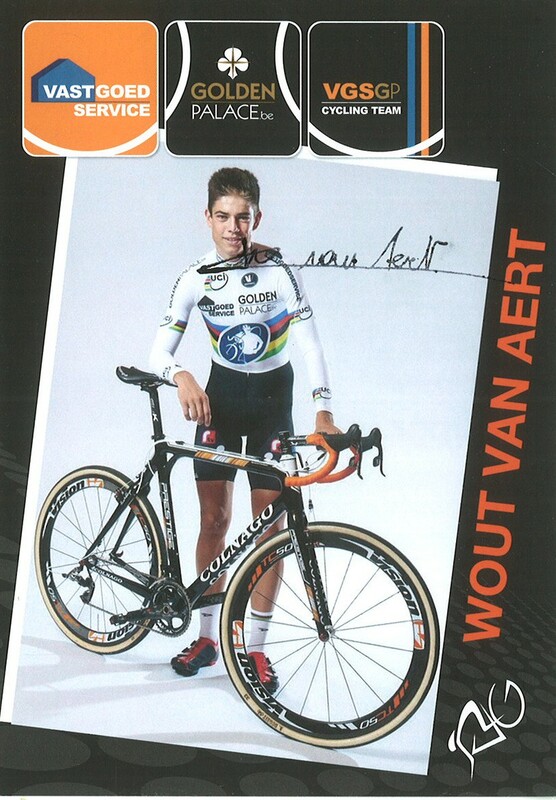 After the initial shock CJ managed to get an autograph card before Van Aert swung a leg over his awaiting Colnago steed with a look of absolute focus on his face as he headed to the line. With minutes now before the start CJ spotted the legend that is Katie Compton warming down on her rollers after coming in 10th suffering from allergies. 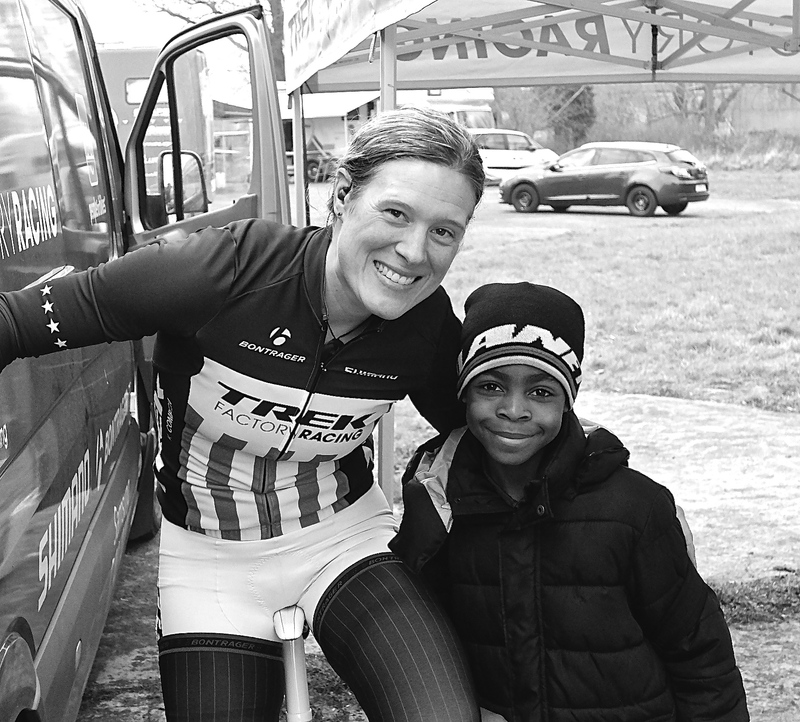 Now considering Katie was last years race winner we presumed she would be unapproachable so soon after the disappointment, but to our surprise she was happy to interrupt her warm down to take a photo and have a chat with a young fan. For that CJ will always be grateful… Thanks Ms Katie. Though from the drop Nys was already making mistakes as he missed his clip and by the first corner he was already out of the top ten and lucky to avoid a mid-pack pile up. Wout Van Aert pushed the early pace and quickly made a split that left Nys in the second group but making up ground slowly. 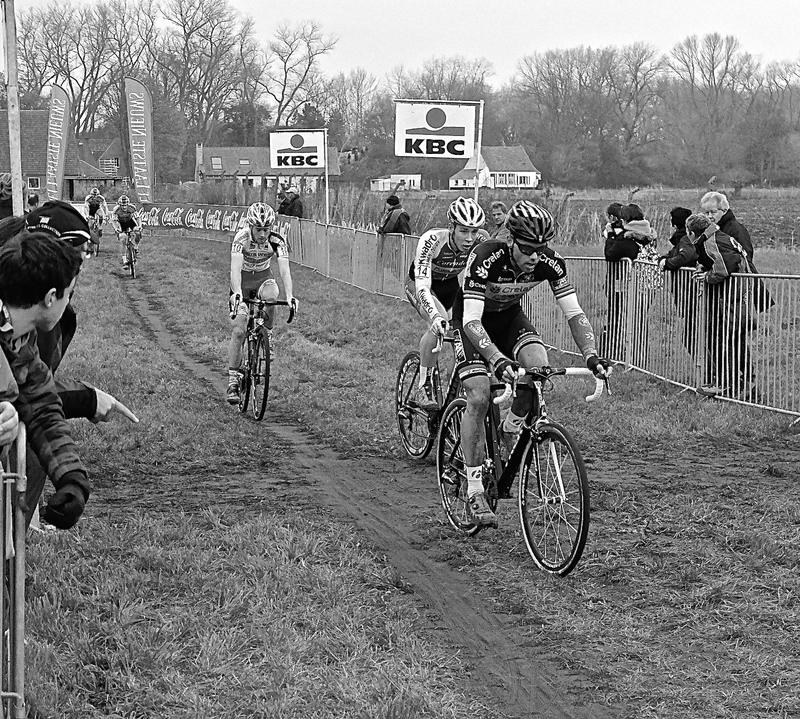 Soon van der Poel and Van Aert made the jump and started to distance themselves from the chasing pack and for a while the young cubs looked like running away with the spoils until van der Poel started making mistakes in the sand traps. Soon he was trying to make back up the time which may have caused him to blow up early. Nys made his way to at best fourth place but was again making minor mistakes costing him time and upsetting his rhythm and when Kevin Pauwels made the jump from the second group, he was left in limbo and soon falling back even further. 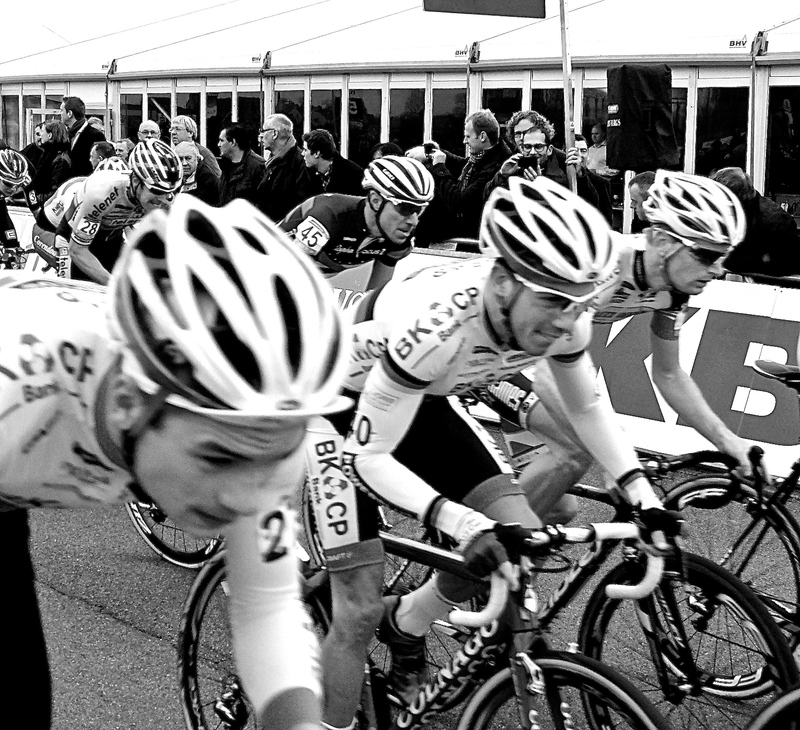 As the laps dropped the Nys fan club were looking strained as for sure another Koksijde podium was fading away. 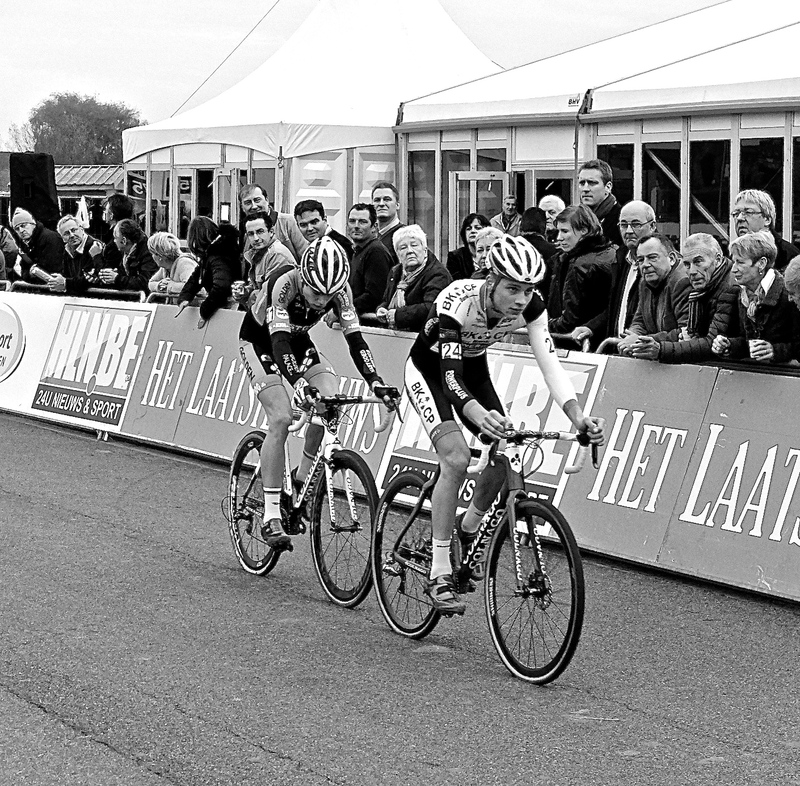 In the meantime Pauwels was pushing to get to van der Poel and soon he was on his wheel and then going into the distance as the chasing pack smelt that a third place was still possible hunting down the now fatigued young rider. By the last lap Van Aert was cruising and displaying a master class in the dunes with over thirty seconds on his rivals, and for good measures he hopped on and off his bike on the finish straight in tribute I guess to last years winner Niels Albert who was forced into early retirement from the sport. 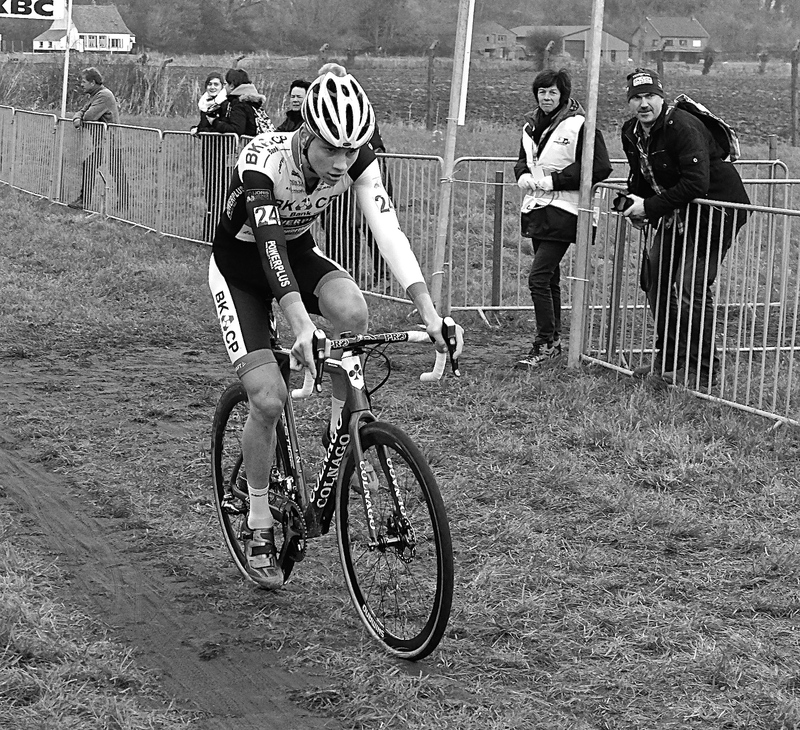 Pauwels then soon crossed the line 41 seconds down on the winner and van der Poel held of the chasing wolves by 2 seconds for a well deserved third placing. 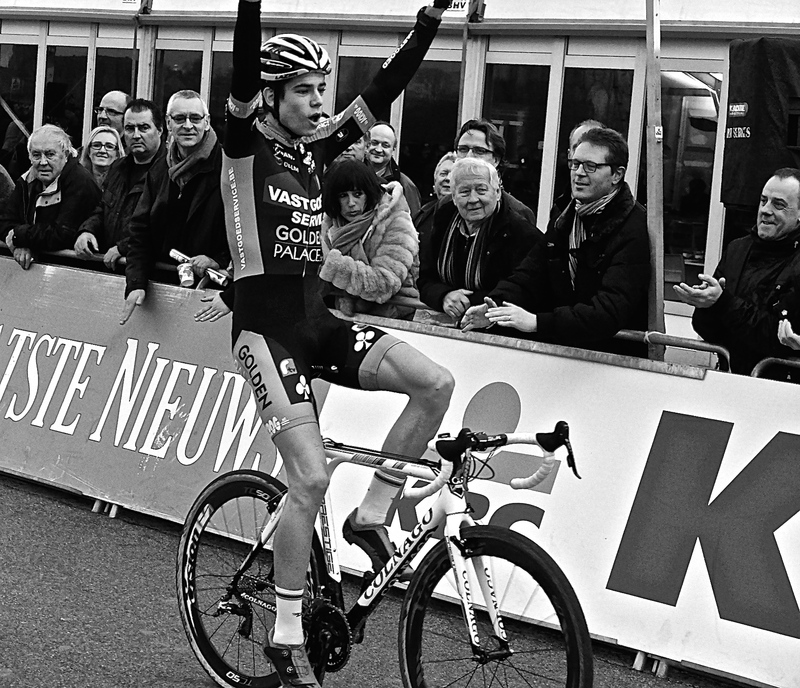 Nys by this time was looking dis-interested and did not even bother to contest the sprinters as they pipped him to 13th position and probably his worse Koksijde result.